How are the envelopes of loadings managed ? For an analyzed structure where too many combinations of load cases are defined, it becomes necessary to create envelopes of combinations in order to determine the peak values of loadings acting on structural elements. 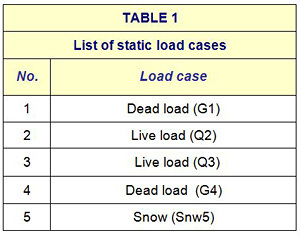 To illustrate how to work with envelopes of loadings, we will consider the static load cases listed in Table 1 and their combinations listed in Table 2. We aim to achieve an envelope which highlights the maximum beam displacement on the vertical direction considering all load combinations, and an envelope of maximum values for the bending moment MY. To do this we will choose an envelope of "Concomitant max" type. Figure 1 and Figure 2 presents the chosen parameters for these envelopes. -	Or from the menu bar - Assumptions - Create an envelope. By choosing an envelope of "Concomitant max" for My, we will ensure that for the analyzed member we will have a maximum bending moment from all chosen combinations, but also the corresponding forces (like axial force and shear force). Note: Selecting the "Concomitant max" or "Concomitant min" envelopes allow the user to choose multiple types of results (e.g., displacements, forces, stresses). By choosing an envelope like "Max/Min", all types of results will be calculated, but the results will be non-concomitant. After computing the finite element analysis, the results can be displayed from the post-processing window (ALT+Z) or from the "Analysis - F.E. results" toolbar.